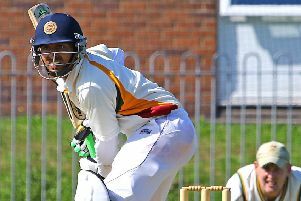 Clitheroe bowler’s hat-trick of wins! Clitheroe bowler Eric Wallace ended an excellent indoor season by completing a unique hat-trick of wins in the veterans’ balloted pairs at Blackpool’s Newton Hall indoor bowling club. Having won the competition for the past two years Eric, of Henthorn Road, partnered by Ken Critchley of Blackpool, comfortably won the final 15-6 to take the title for a record breaking third-consecutive years. This hat-trick was the culmination of a very successful season having reached the last 16 of the national over 60s fours, teaming up with Charlie Cowsill (Bolton) Steve Goulding (Southport) and Steve Airey (Blackpool), and the last 32 of the national over 60s pairs with John Schofield (Darwen). Eric said: “Having been narrowly defeated by the eventual national runners-up, it was great to go so far but falling at the final hurdle to reach the prestigious national finals was a big disappointment. “It just makes me more determined next winter as it is still an ambition of mine.